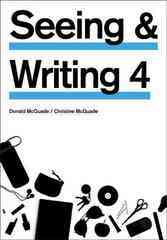 Seeing and Writing 4 Edition The first full-color composition reader truly to reflect visual culture, Seeing & Writing is based on a simple principle: Careful seeing leads to effective writing. Students actively and critically see the details of each verbal and visual text, think about its composition and the cultural context within which it operates, and then write thoughtfully and convincingly about it. With a new look, new features, and new essays and images, Seeing & Writing 4 continues to lead the way — as a visual, flexible, and above all, inspiring tool for the composition classroom.